Mexico claimed their seventh CONCACAF Gold Cup title on Monday, taking down a brave Jamaica side 3-1 in the final in Philadelphia. After sneaking past Costa Rica and Panama in the quarter-finals and semi-finals respectively, El Tri ran out to a 3-0 lead against the Reggae Boyz before Darren Mattocks pulled one back for Winfried Schaefer's side. The late goal from the Vancouver Whitecaps forward was too little too late for Jamaica as Mexico triumphed in celebration for the seventh time on the continental stage. 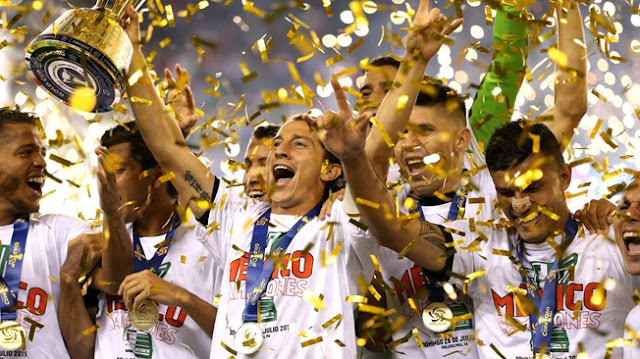 After the final whistle, Andres Guardado, who scored a cracking 31st-minute goal to open the floodgates for El Tri, lifted the Gold Cup and celebrated with his team-mates amidst a shower of golden confetti at Lincoln Financial Field in front of 68,930 fans. The celebrations will be short lived for Miguel Herrera's troops, however, as Mexico must face USA in a one game play-off on 9 October at the Rose Bowl in Pasadena, California for a place in the FIFA Confederations Cup Russia 2017.